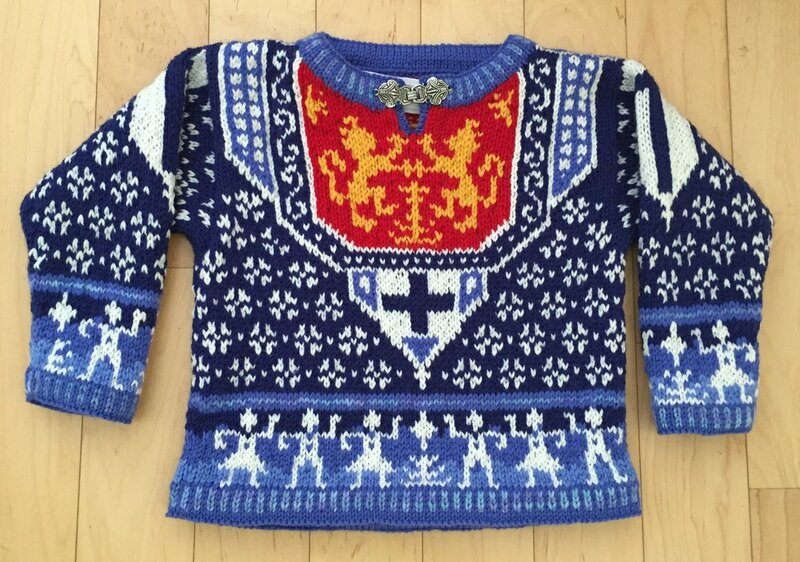 This is a Finnish variation of the (forthcoming on this page) Norwegian shield sweater. Here the white snowflakes are on a dark blue background. The inset at the front and back is a striking pattern of yellow lions on a red background. There are also mini flags in the Finnish colors. At the hem and the wrists is a traditional pattern of people in white on a varying blue background. At the neck, wrist, and hem is a pattern of alternating stripes in variegated blue and periwinkle. The back and front are similar with small adjustments. On the sleeves are more snowflakes with another variation of the Finnish flag. This is my nod to my little-known Finnish grandfather. The Olympics has always been interesting to me. I loved the Lillehammer Olympics, with the iconic graphics and ladies in flowing skirts skiing down the mountain during the opening ceremonies. I have tried unsuccessfully to recreate the icons of the sports that I kept from the Washington Post into a sweater. But the iconic Scandinavian shapes work well here. This is a colorful pattern of white snowflakes on dark blue. The inset is variegated red roses and green leaves on a periwinkle background. The sleeves are variations on the main pattern, with the roses insert at the top of the arm. The wrists and hem trim is dancers in white on periwinkle. The neck, wrists, and hem have picot trim in alternating stripes of red and variegated blue. This sweater is a pattern of white snowflakes on a red background. Inset at the front and back is a striking pattern of white lions on a dark blue background. There are also mini flags in the Norwegian colors. At the hem and the wrists is a traditional pattern of people in white on a darker red background. At the neck, wrists, and hem is a pattern of alternating stripes in variegated red and dark blue and variegated. The back and front are similar with small adjustments. On the sleeves are more snowflakes with another variation of the Norwegian flag. 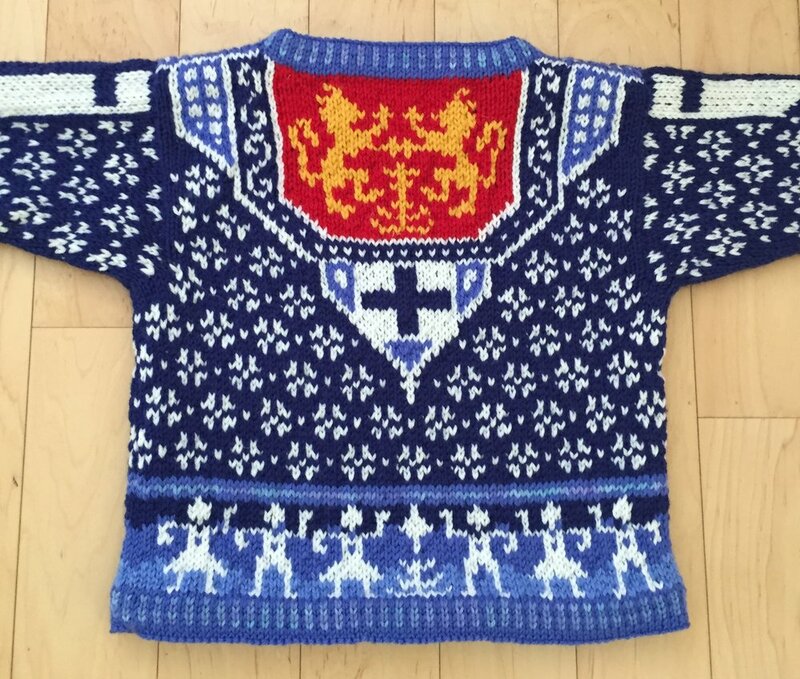 You don't have to be Norwegian to knit this sweater!